SKIP is a transcription cofactor in many eukaryotes. It can regulate plant stress tolerance in rice and Arabidopsis. But the homolog of SKIP protein in soybean has been not reported up to now. In this study, the expression patterns of soybean GAMYB binding protein gene (GmGBP1) encoding a homolog of SKIP protein were analyzed in soybean under abiotic stresses and different day lengths. The expression of GmGBP1 was induced by polyethyleneglycol 6000, NaCl, gibberellin, abscisic acid and heat stress. GmGBP1 had transcriptional activity in C-terminal. GmGBP1 could interact with R2R3 domain of GmGAMYB1 in SKIP domain to take part in gibberellin flowering pathway. 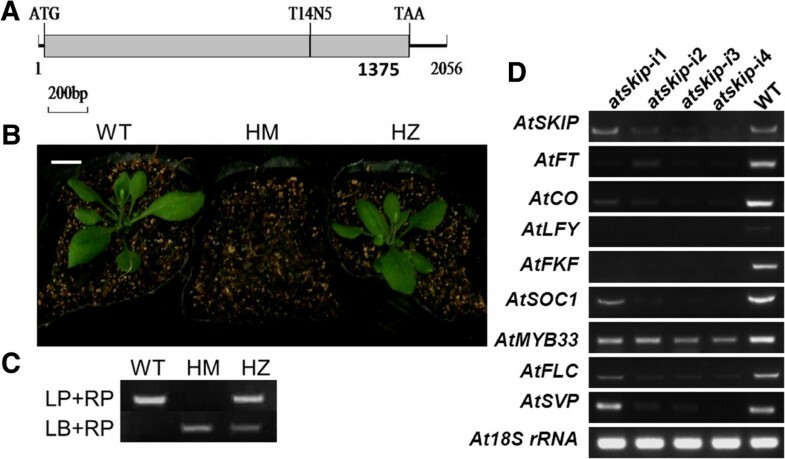 In long-day (16 h-light) condition, transgenic Arabidopsis with the ectopic overexpression of GmGBP1 exhibited earlier flowering and less number of rosette leaves; Suppression of AtSKIP in Arabidopsis resulted in growth arrest, flowering delay and down-regulation of many flowering-related genes (CONSTANS, FLOWERING LOCUS T, LEAFY); Arabidopsis myb33 mutant plants with ectopic overexpression of GmGBP1 showed the same flowering phenotype with wild type. In short-day (8 h-light) condition, transgenic Arabidopsis plants with GmGBP1 flowered later and showed a higher level of FLOWERING LOCUS C compared with wild type. When treated with abiotic stresses, transgenic Arabidopsis with the ectopic overexpression of GmGBP1 enhanced the tolerances to heat and drought stresses but reduced the tolerance to high salinity, and affected the expressions of several stress-related genes. In Arabidopsis, GmGBP1 might positively regulate the flowering time by affecting CONSTANS, FLOWERING LOCUS T, LEAFY and GAMYB directly or indirectly in photoperiodic and gibberellin pathways in LDs, but GmGBP1 might represse flowering by affecting FLOWERING LOCUS C and SHORT VEGETATIVE PHASE in autonomous pathway in SDs. GmGBP1 might regulate the activity of ROS-eliminating to improve the resistance to heat and drought but reduce the high-salinity tolerance. Flowering time plays key roles in plant development, plant adaptation to growing regions , crop yield [2, 3] and disease resistance . Abiotic stress such as drought, high salinity and heat, is another major limiting factor for crop yield . Genetic and molecular analyses has revealed that several distinct but linked signaling pathways regulate the flowering-time in response to light and temperature signals or to internal signals such as vernalization, autonomous pathways and gibberellin signal pathway [1, 5–7]. Interaction of different signal transduction pathways before their convergence may allow a coordinated regulation of the activity of the respective pathways. The signals from these pathways are integrated through up-regulating the expression of one or more common target genes: FT, SOC1 and LFY to determine when flowering. The expressions of SOC1 and FT are negatively regulated by FLC but positively regulated by CO[8, 9]. FLC, a MADS-box transcription factor, is a negative regulator of floral initiation and an integrator of the autonomous and vernalization pathways. CO, encoding a B-box zinc-finger transcription factor, integrate circadian clock and light signals and up-regulate the expression of FT and SOC1 directly in the long-day pathway . CONSTANS and GAMYB (AtMYB33) regulate the expression of LFY by binding with different cis-acting elements in the promoter of LFY respectively [11–14]. SKIP is a transcription cofactor in many eukaryotes. All the SKIP homologs identified so far contained a SKIP domain with an S-N-W-K-N peptide signature and may have conserved basic functions, such as acting as a cofactor in transcription and splicing . However, the derived or additional functions of the SKIP homologs varied among species. SKIP was an essential protein for pre-mRNA splicing in Saccharomyces cerevisiae. In Drosophila melanogaster, SKIP was involved in ecdysone-stimulated transcription  and known to be a coactivator in Notch [18, 19]. In Caenorhabditis elegans, SKIP was an essential component of many RNA polymerase II transcription complexes and indispensable for C. elegans development . In Hordeum vulgare L., SKIP could interact with GAMYB. In Oryza sativa L., OsSKIPa could positively modulate cell viability and stress tolerance . AtSKIP functions as not only a positive regulator and putative potential transcription factor in the abiotic stress signaling pathway in Arabidopsis , but also a component of the spliceosome linking alternative splicing and the circadian clock in Arabidopsis . However, there has been no report on the identification of SKIP homologs in soybean and on their functions in the regulation of flowering time in any species so far. In this study, the expression patterns of soybean GAMYB binding protein encoding a homolog of SKIP protein were analyzed under several abiotic stresses and light conditions. Yeast two-hybrid assay was performed to identify the interactions between GmGBP1 and GmGAMYB1. The phenotypes of transgenic Arabidopsis lines in different stress and day-length were analyzed to study the function of GmGBP1. The SKIP homolog gene in soybean was obtained from subtracting long-day from short-day treated mRNA. The predicted gene, named as GmGBP1 (Glycine max GAMYB-binding protein gene, GenBank DQ112540), wasamplified from the cDNA of DongNong 42 using PCR. The full length cDNA of GmGBP1, containing 2253 bp with an open reading frame of 1,839 bp, was predicted to encode 612 amino acids. GmGBP1 protein had a predicted isoelectric point (pI) of 8.69 and a molecular weight (MW) of 69.10 kDa. Sequence alignment indicated that SKIP proteins were highly conserved in eukaryotes. The SKIP protein domain of GmGBP1 was located between amino acids 190 and 360 (Figure 1A) with an S-N-W-K-N peptide signature (Figure 1B). A BLAST search was performed against the assembled soybean genome databases (http://www.phytozome.org) to analyze the SKIP sequences in viridiplantae. The phylogenetic tree based on the SKIP sequences agreed well with the evolutionary relation among these species those were divided into four groups (Figure 1D). Identification of SKIP homologs in soybean. (A) Predicted domains and motifs of soybean SKIP homolog, GmGBP1. (B) Multiple alignment of the predicted amino acid sequences in peptide signature of SKIP homologs from soybean (GmGBP1, DQ112540), Arabidopsis (AtSKIP, O80653), rice (OsSKIP,), human (HsSKIP, Q13573), Caenorhaabditis elegans (CeSKIP, Q22836), Drosophila (DmBX42, P39736), Saccharomyces cerevisiae (ScPRP45, Q09882). (C) Detection for self-transactivation of GmGBP1. The deletion mutants (shown on right), GmGBP1, GmGBP1a (amino acids 1–189), GmGBP1b (amino acids 190–356) and GmGBP1c (amino acids 357–612), were constructed by PCR. Self-transactivation, as illustrated by the color reaction in the 5-bromo-4-chloro-3-indolyl-β-D-galactopyranoside(X-Gal) assay, occurred with 1h for pBD-GmGBP1 and pBD-GmGBP1c constructs. Overnight incubation failed to produce a self-activation reaction with the pBD-GmGBP1a and pBD-GmGBP1b constructs. And the transformants were streaked on SD agar plates lacking His, Trp and incubated at 30°C for 72 h. The pBD-GmGBP1 and pBD-GmGBP1c constructs could grow normally but no growth for the pBD-GmGBP1a and pBD-GmGBP1b constructs. (D) Phylogenetic relationships of SKIP homologs in plant constructed using the neighbor-joining method with the program MEGA 5.05. A yeast transformation was used to detect the transcriptional activity of GmGBP1. GmGBP1, GmGBP1a, GmGBP1b and GmGBP1c were fused to the GAL4 DNA-binding domain and transformed into yeast strain YRG-2 cells respectively. The proteins of GmGBP1 and GmGBP1c were both capable of inducing LacZ expression in yeast cells and could grow in the medium lacking His, indicating that GmGBP1 protein had transcriptional activity in its C-terminal domain (Figure 1C). A quantitative RT-PCR was performed to analyze the expression of GmGBP1 in soybean. GmGBP1 could express in all tissues or organs investigated in both LDs and SDs, although the expression levels were different. The expression levels in stem and immature seed were much higher than those in root, trifoliate leaf, flower bud, pod and leaf. The trifoliate leaf had the lowest expression level in LDs, but the highest expression level in SDs in the seven samples detected. All the organs, except of stem, showed higher expression in SDs than in LDs (Figure 2F). The expression of SKIP homologs in rice and Arabidopsis have been confirmed to be affected by stresses and phytohormones (Xin et al. 2009; Gah-Hyun et al. 2010). Therefore, the expression level of GmGBP1 in soybean was also analyzed with stresses and phytohormones treatments in the present study. The results indicated that the transcriptional level of GmGBP1 was increased after treated with 100 μmol ABA (Figure 2A), 100 μmol GA (Figure 2C), 200 mM NaCl (Figure 2B), 8% PEG6000 (Figure 2D) and temperature 42°C respectively (Figure 2E). Expression patterns of GmGBP1 in soybean. (A, B, C, D and E) Expression level of GmGBP1 in leaf of soybean treated with 100μmol ABA, 200mM NaCl, 100μmol GA, 8% PEG6000 and heat stress respectively. (F) Tissue-specific expression of GmGBP1 in LDs and SDs. Tissues tested were root (RO), stem (ST), leaf (LE), trifoliate leaf (TL), flower bud (FB), pod (PO) and immature seed (IS). In barley, it was confirmed that HvGAMYB could interact with a SKIP domain by yeast two-hybrid system . Therefore, a yeast two-hybrid assay was performed to study the interaction between GmGBP1 and GmGAMYB1. GmGAMYB1 contained a typical R2/R3-MYB DNA-binding domain and three conserved regions (BOX1, BOX2 and BOX3). GmGAMYB1 was more homologous to AtMYB33 rather than AtMYB65 and AtMYB101 (Figure 3A, Figure 3B). As GmGBP1 showed transcriptional activity in the C-terminal domain, the pBD-GmGBP1a and pBD-GmGBP1b were chosen for the bait vectors to search the protein interaction with GmGAMYB1. Moreover, the prey was divided into two parts (1–141,142-538) by the domain area of R2R3, as pAD-GmGAMYB1, pAD-GmGAMYB1a and pAD-GmGAMYB1b. The co-transformation with pBD-GmGBP1a and the prey plasmid could not grow on SD/-TLH, indicating that the section of GmGBP1 had no ability to interact with GmGAMYB1 (Figure 3C). Furthermore, the yeast cells with pBD-GmGBP1b and pAD-GmGAMYB1b showed no ability to interact with GmGAMYB1 (Figure 3D). In contrast, the section b of GmGBP1 interacted with GmGAMYB1 by binding to the domain of GmGAMYB1 as the result of the growth on SD/-TLH, exhibiting the positive color reaction (blue on the X-Gal filter assay, Figure 3B). Yeast Two-Hybrid Assay of Interaction between GmGBP1 and GmGAMYB1. (A) Phylogenetic relationships between GmGAMYB1 (HM447241) and GAMYB homologs (AtMYB33, NM_180448; AtMYB65, NM_111977; AtMYB101, NM_128805.3) in Arabidopsis using the neighbor-joining method with the program MEGA 5.05. (B) Multiple alignment of the amino acid sequences in domain and motify of GmGAMYB1, AtMYB33, AtMYB65 and AtMYB101. (C) The growth of Yeast YRG-2 cells cotransformated by pBD-GmGBP1a with pAD-GmGAMYB1, pAD-GmGAMYB1a (amino acids 1–141) or pAD-GmGAMYB1b (amino acids 142–538) on synthetic minimal (SD) medium lack of Trp and Leu (SD/-TL) or Trp, Leu and His (SD/-TLH). (D) The growth of Yeast YRG-2 cells cotransformated by pBD-GmGBP1b with pAD-GmGAMYB1, pAD-GmGAMYB1a or pAD-GmGAMYB1b on SD/-TL and SD/-TLH, and the X-Gal assay for the transformations. An insertion of a T14N5 fragment at the 1344 bp of exon of AtSKIP caused mutant (Figure 4A). The mutant atskip had the same germination rate with the WT plant (>99%), and all of the plants could grow normally in the MS medium. However, 100% of the homologous plants died within 2 weeks after transplanting in soil before flowering whereas all WT and heterozygous plants grew normal under the same conditions (Figure 4B, Figure 4C). The homozygosity of mutant was detected by PCR and RT-PCR after transplanting in soil. Identification of atskip mutant plants in phenotypes and genotype. (A) A T-DNA insertion caused the mutant of AtSKIP. (B) Phenotypes of homozygous atskip mutant (HM), heterozygous atskip mutant (HZ) and wild type Col-0 plant (WT). Bars = 1.0cm. (C) PCR tests for genotype to identify the mutant. (D) RT-PCR analysis for the down-regulated genes (AtFT, NM_105222.2; AtCO, NM_001036810.1; AtLFY, NM_125579; AtFKF, Q9C9W9; AtSOC1, NP_182090.1; AtFLC, Q9S7Q7; AtSVP, Q9FUC1) in atskip-i plants. Considering the homozygous mutant of AtSKIP was lethal, RNAi was used to produce the atskip-i plant to suppress the expression of this gene. Although the expression of AtSKIP was only partially suppressed (Figure 4E), the plants showed abnormal phenotypes such as late flowering, small rosette leaves. According to RT-PCR analyses, the expressions of several key flowering-related genes were down-regulated (Figure 4E). The promotion and inhibitory factors of flowering were both down-regulated, which suggested that SKIP might be involved in more than two different flowering pathways. Since GmGBP1 was up-regulated by stresses and stress-related phytohormones, Arabidopsis thaliana plants, containing extra copies of GmGBP1 gene, was produced to investigate whether overexpression of this gene could enhance stress tolerance. The transgenic lines were confirmed by PCR and RT-PCR with homolog-specific primers (data not shown). In the MS medium containing ABA (1 and 3 μM), the germination rates of GmGBP1-ox and atskip-i plants were both reduced compared to WT (Figure 5A), indicating that ectopic expression of GmGBP1 could increase the growth-suppression effect of ABA and AtSKIP might have the ability of reducing the negative effect of ABA. In the MS medium containing NaCl (150 and 200 mM), the germination rates of GmGBP1-ox and atskip-i plants were also lower than the WT plants (Figure 5A, Figure 5C), suggesting that GmGBP1 decreased salt tolerance and AtSKIP improved the ability to salt tolerance. However, the germination rates of the three plants under 300 mM mannitol showed no difference (data not shown). A further study was performed to detect the stress tolerance of GmGBP1. When 20 days old plants growing in soil under SDs were treated with drought condition (no watering for 7 days), nearly all of the GmGBP1-ox plants were recovered at 3 days after re-watering, whereas only 40-60% of WT plants and none of atskip-i plants were recovered (Figure 5B). The root lengths of both GmGBP1-ox and atskip-i plants were shorter than that of WT plants in the MS medium treated with 150 mM NaCl for 10 days (Figure 5D); The GmGBP1-ox and atskip-i plants treated with 200 mM NaCl for 10 days under LDs were nearly dead, while 80-90% of WT plants survived (Figure 5D). Performance of seedling under stress condition. (A) The germination rate of plants treated with 1 μM ABA, 3 μM ABA, 150 mM NaCl or 200 mM NaCl individually. (B) Performance of seedlings treated with drought. Effect of 20 days old plants growing in soil in SDs treated with drought (no water for 7days), photos at 3 days after rewatering, Bars = 1.0 cm. (C) Phenotypes of seedlings treated with 150mM NaCl. Germination of plants growing in MS medium with 150mM NaCl, photos at 7 days after germination; Growth of plants cultivated in MS medium with 150mM NaCl vertically, photos at 10 days after germination. Bars = 1.0 cm. (D) Effect of 20 days old plants growing in soil in LDs treated with 200mM NaCl every other day for 3 times, photos at 10 days after treated. Bars = 1.0 cm. (E) Performance of seedling under heat: a, b and c: effect of plants of 7 days old under 37°C for 5 days; d, e and f: effect of plants of 15 days old under 37°C for 8 days. Bars = 0.5 cm. (F) The relative level of MDA and SOD of plants under stress conditions. 20 days old plants growing in soil in SDs treated with 42°C for 36h, samples were prepared from rosette leaf after recovered for 1 day; 20 days old plants growing in soil in LDs, samples were prepared from rosette leaf after treated with drought (no water for 7 days); 20 days old plants growing in soil in LDs treated with 200mM NaCl every other day for 3 times, samples were prepared from rosette leaf after 7days. Data were from more than 8 individuals for each genotype ± SD. * t test, P < 0.05; ** t test, P < 0.01. Heat tolerance experiment revealed that GmGBP1 might improve heat tolerance of Arabidopsis plants with ectopic expression of GmGBP1. 7days old plants of transgenic Arabidopsis, treated with 37°C for 5 days, exhibited symptom of flagged leaves, but WT and atskip-i plants showed more serious symptom with whitened leaves (Figure 5E: a, b and c). Furthermore, WT and atskip-i plants of 15days old showed more whitened leaves, even dead after treated with 37°C for 8 days, whereas GmGBP1-ox plants showed more vital (Figure 5E: d, e and f). The GmGBP1-ox plants had a higher Superoxide dismutase (SOD) level than both atskip-i and WT plants under heat or drought conditions. 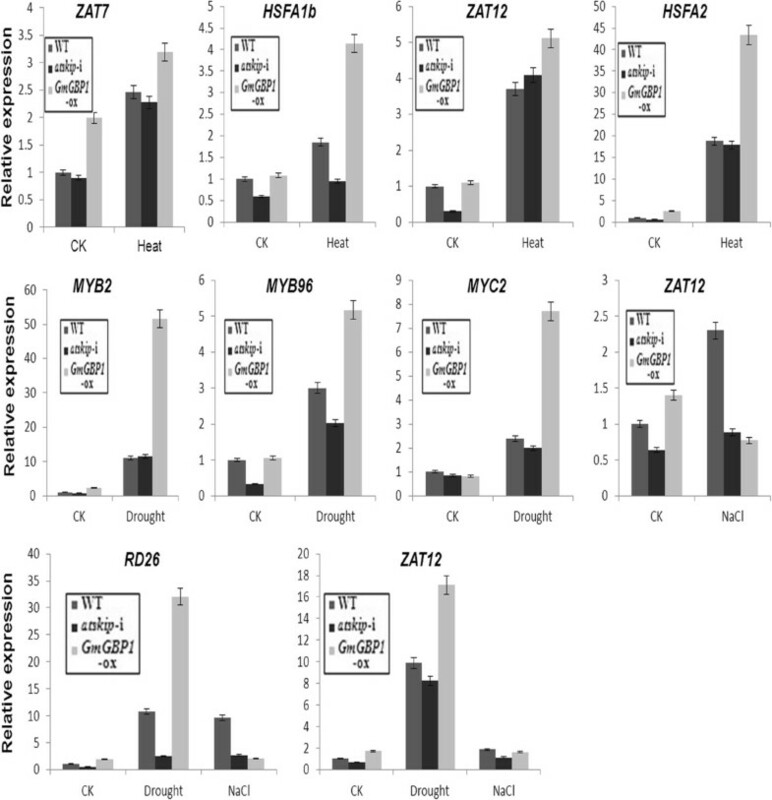 The malondialdehyde (MDA) level of GmGBP1-ox plants was much lower than both atskip-i and WT plants, indicating that the ectopic expression of GmGBP1 in Arabidopsis might enhance the heat and drought tolerance. However, the highest MDA level and the lowest SOD level of GmGBP1-ox plants implied the reduced salt tolerance in GmGBP1-transgenic Arabidopsis (Figure 5F). To gain further insight into the mechanism of the altered stress resistance of GmGBP1-ox plants, transcript levels of 8 stress-responsive genes [25–28] were assayed in the GmGBP1-ox, atskip-i and WT plants under normal and stress conditions. The expression levels of all the 8 genes in GmGBP1-ox were higher than WT and atskip-i plants (Figure 6). Moreover, ZAT7, ZAT12, HSFA1b and HSFA2 showed significantly higher expression level in GmGBP1-ox than in WT and atskip-i plants after treated with 42C for 2h (Figure 6), MYB2, MYB96, MYC2, RD26 and ZAT12 were up-regulated after drought for 7days (Figure 6). 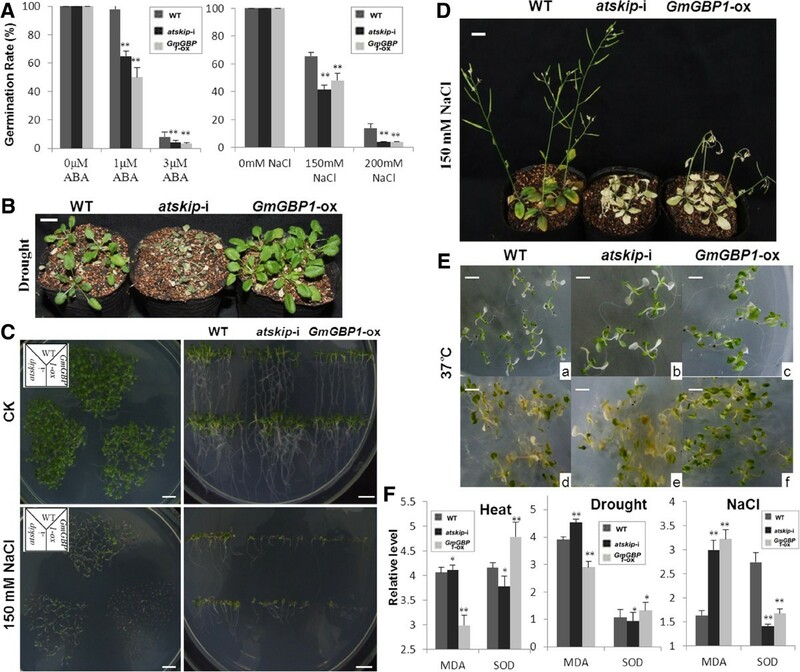 These results suggested that overexpression of GmGBP1 can increase the transcript levels of some stress-resistance genes under drought or heat stress conditions, thus improving the drought or heat resistance of the transgenic plants. However, the expression levels of RD26, ZAT7 and ZAT12 in GmGBP1-ox plants were significantly lower than WT and atskip-i plants after treated with 200 mM NaCl for 7 days (Figure 6), indicating that GmGBP1 might reduce the resistance to high salinity. Expression of stress resistance-related genes in WT, GmGBP1-ox and atskip-i plants. ZAT7, NM_114478.3; ZAT12, AY050915.1; HSFA1b, NM_121688; HSFA2, NM_001124916; RD26, NM_001084983; MYC2, NM_102998; MYB96, NM_125641; MYB2, NM_130287. The response to day-length implied the possibility of flowering-related functions of GmGBP1. In LDs condition (16-h light), the T3 plants of GmGBP1-ox Arabidopsis flowered 2 days earlier and had fewer rosette leaves than WT plants, and the atskip-i plants flowered significantly late (Figure 7A, Figure 7D). Furthermore, the expressions of CONSTANS (CO) and FLOWERING LOCUS T (FT) in GmGBP1-ox plants were increased compared to WT and atskip-i plants, and atskip-i plants had the lowest expression levels of CO and FT (Figure 7B), indicating that GmGBP1 could control the flowering time by up-regulating flowering-related gene CO and FT in LDs. Effect of WT, atskip-i, GmGBP1-ox, myb33 and GmGBP1-ox/myb33 plants. (A) Phenotypes of plants in LDs and SDs. Photos at 25 days after germination in LDs; Photos at 42 days after germination in SDs. Bars = 1cm. (B) Expression level of flowering related gene in Arabidopsis. RT-PCR analysis for AtCO and AtFT in WT, atskip-i, GmGBP1-ox plants in LDs; RT-PCR analysis for AtFLC for plants in SDs. Samples were prepared from rosette leaves before bolting in LDs or SDs. (C) Expression level of AtLFY in plants. Samples were prepared from rosette leaves before bolting in LDs. (D) Flowering time of plants in LDs and SDs. Flowering time was measured as the total number of rosette leaves or days to bolting. Data were from more than 20 individuals for each genotype ± SD. WT plants compared with atskip-i, GmGBP1-ox, myb33 and GmGBP1-ox/myb33 plants, respectively. * showed significant to WT plant at 0.05 level (P < 0.05) by t-test; ** showed significant to WT plant at 0.01 level (P < 0.01) by t-test. However, in the short-day (SD) condition, the T3 plants of GmGBP1-ox Arabidopsis flowered latest and had the most rosette leaves (Figure 7A, Figure 7D). In contrast, atskip-i plants showed the earliest flowering and had the fewest rosette leaves. This result suggested that there might be some other ways to regulate flowering in SDs. The key flowering inhibitor gene, FLC, was significantly up-regulated in GmGBP1-ox plants (Figure 7B). All the results suggested autonomous pathway could account for the late flowering phenotype. Previous reports showed that AtMYB33 influenced flowering by mediating GA responsiveness of the LFY promoter [12, 14], and was down-regulated in atskip-i plant in this study (Figure 4D). myb33 mutant plants (SALK058312) and myb33 mutant plants containing extra copies of GmGBP1 gene were introduced to investigate the impact of the interaction between GmGBP1 and GmGAMYB1 on flowering. In LDs, no effect on flowering time and leaf numbers was observed in GmGBP1-ox/myb33 plants (Figure 7A, Figure 7D), and the expression level of LFY in GmGBP1-ox/myb33 plants was same to the level of WT, but GmGBP1-ox plants had a high level of LFY (Figure 7C). GmGBP1 was directly located on the upstream of GAMYB, and regulate flowering in LDs. 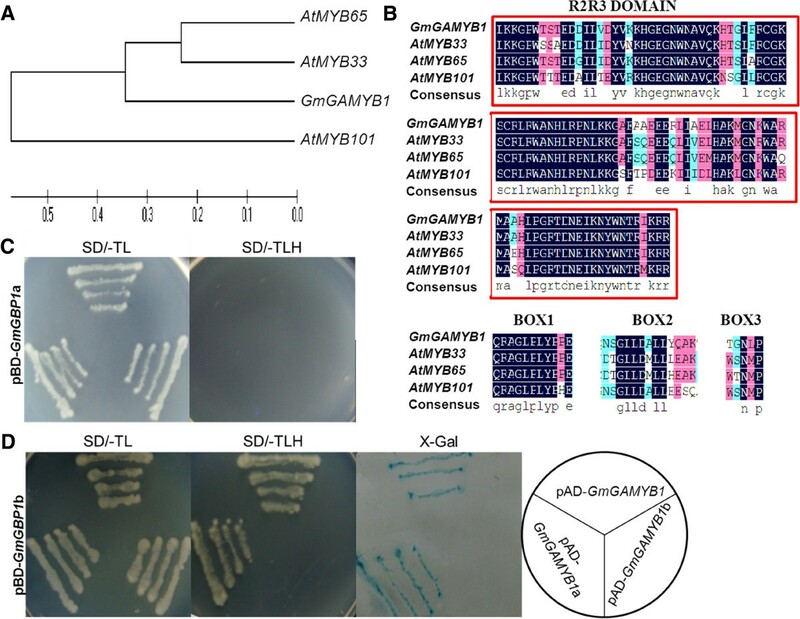 Since GmGBP1 regulated flowering in autonomous pathway in SDs, a further study was performed to investigate the responsibility of MYB33 in the late flowering phenotype. The result revealed that GmGBP1-ox/myb33 plants also showed late flowering like GmGBP1-ox plants (Figure 7A and Figure 7D), suggesting that GmGBP1 was independent of MYB33 in delaying flowering time in SDs. SKIP protein, as a spliceosome component, played a vital role in maintaining cell viability in yeast (PRP45), C. elegans (CeSKIP) and O. sativa (OsSKIPa) [16, 20, 22]. The homozygous mutant of AtSKIP in Arabidopsis resulted in death of plants, which was similar to the phenotype of severe growth arrest and even death of O. sativa with suppression of OsSKIPa and embryonic arrest of the CeSKIP mutant in C. elegans, which indicated that AtSKIP was also required for maintaining cell viability and normal growth in Arabidopsis. The indispensable role of SKIP homolog in keeping normal cell viability and growth might be conserved in plants, which was supported by that the plant SKIP homologs possessed the conserved SKIP domain for cell viability identified in PRP45. However, it needs further study to confirm whether the SKIP homologs in soybean could have the conserved function for cell viability. Drought and high-salinity repressed plant growth and limited seed yield. SKIP homologs in Arabidopsis and rice could improve the tolerance to drought and high-salinity [22, 23]. In this study, the ectopic expression of GmGBP1 in Arabidopsis could enhance the tolerance to drought. However, GmGBP1-ox plants showed a salt-sensitive appearance, although atskip-i plants reduced the tolerance to salt as previous report . Thus, the tolerance of SKIP homologs to salt might be not conserved in plant. Heat, one of serious environmental stresses, affected the growth of plants and the productivity of crops. There was no report about heat tolerance of SKIP homologs previously. Our result showed that GmGBP1-ox plants increased the tolerance to heat whereas atskip-i plants reduced the tolerance to heat, indicating that AtSKIP has the ability of heat tolerance. Reactive oxygen species (ROS) could be induced by abiotic stresses, and over-accumulation of ROS could lead to cell damage and even death. SOD was used to eliminate ROS, and MDA was the intermediate product during the elimination of ROS [29, 30]. In this study, the raised content of ROS in GmGBP1-ox plants treated with salinity and the decreased content of ROS in GmGBP1-ox plants treated with heat (or drought) indicated that the altered stress tolerance of GmGBP1-ox plants may be partially due to the regulation of the activity of ROS-eliminating. Interestingly, in this study ectopic expression of GmGBP1 in Arabidopsis induced earlier flowering in LDs and late flowering in SDs. The finding of a flowering-regulation function from a SKIP homolog has not yet been reported in any plants so far. The specific function of GmGBP1 in regulating flowering time might be especially useful for developing soybean cultivars with the adaptability to broad grow regions. Flowering time was controlled by several signaling pathways, such as the day-length, vernalization, autonomous pathways and gibberellin signal pathway [1, 5–7], and it could be measured by scoring the number of rosette leaves at flowering time and the number of days from germination to bolting in Arabidopsis . The number of rosette leaves at flowering time and the number of days from germination to bolting measured in GmGBP1-ox plants were both reduced in LDs, suggesting that ectopic expression of GmGBP1 induced early flowering. atskip-i plants delayed flowering in LDs supported the early flowering of GmGBP1-ox plants in another hand. However, when GmGBP1 ectopicly expressed in myb33 plants, no early flowering could be observed in LDs, indicating that the early flowering function of GmGBP1 might depend on the existence of MYB33. When the transgenic lines were transferred into SDs, the phenotypes of flowering were all changed. The flowering times of GmGBP1-ox and GmGBP1-ox/myb33 plants were both delayed significantly, and atskip-i displayed the early flowering phenotype in SDs. The expression levels of numerous flowering-related genes could be induced by day-length or gibberellin. The expression level of GmGBP1 was regulated by both day-length and gibberellin, suggesting that GmGBP1 might participate in both day-length and gibberellin signal pathways. In atskip i plants of Arabidopsis, the expression levels of more than 10 flowering-related genes were affected. In particular, the mRNA levels of several flowering integrators (FT LFY and SOC1) were significantly lower. Our results showed that FT and LFY were both up-regulated in GmGBP1-ox plants in LDs, but LFY showed no change when GmGBP1 was ectopic expression in myb33 mutants. Considering the interaction between GmGBP1 and GmGAMYB1, and the conserved function on photoperiodic flowering of FT homologs in soybean [32–34], GmGBP1 might regulate flowering time in two ways by its function as a transcription factor and interaction in LDs. On one hand, GmGBP1 could regulate the expressions of flowering-related genes in day-length signal pathway, and on the other hand, GmGBP1 could bind with GmGAMYB1 in gibberellin signal pathway to control flowering time. Many reports had revealed that GA pathway played a key role in flowering under SD condition when other regulatory pathways that promoted flowering were not active [1, 7, 35–37]. However, the late flowering of GmGBP1-ox plants indicated that there might be another way to control flowering in SDs. FLC was a negative regulator of floral initiation and an integrator of the autonomous and vernalization pathways. FLC could directly down-regulated FT and SOC1 to repress the flowering in these pathways [8, 9, 38]. SVP, a MADS box transcription factor, could interact with FLC and acted as partially redundant repressors of flowering time with FLC. The negative action on the phenotypes of the down-regulated FLC and SVP in atskip-i plants in LDs suggested that flowering time was regulated crossly by several signal pathways and SKIP might take part in more than two ways. In SDs, the expression of FLC was up-regulated in GmGBP1-ox plants, and was down-regulated in atskip-i plants as that in LDs. The late flowering of GmGBP1-ox plants in SDs elucidated that GmGBP1 might delay flowering time in SDs through autonomous pathway by improving the expression level of FLC, a key flowering inhibitor factor. In general, GmGBP1 might regulate flowering time by three signal pathways. GmGBP1 positively controlled the flowering time by regulating CO, FT, LFY and GAMYB directly or indirectly in photoperiodic and gibberellin pathways in LDs, GmGBP1 repressed flowering by regulating FLC and SVP in autonomous pathway in SDs. 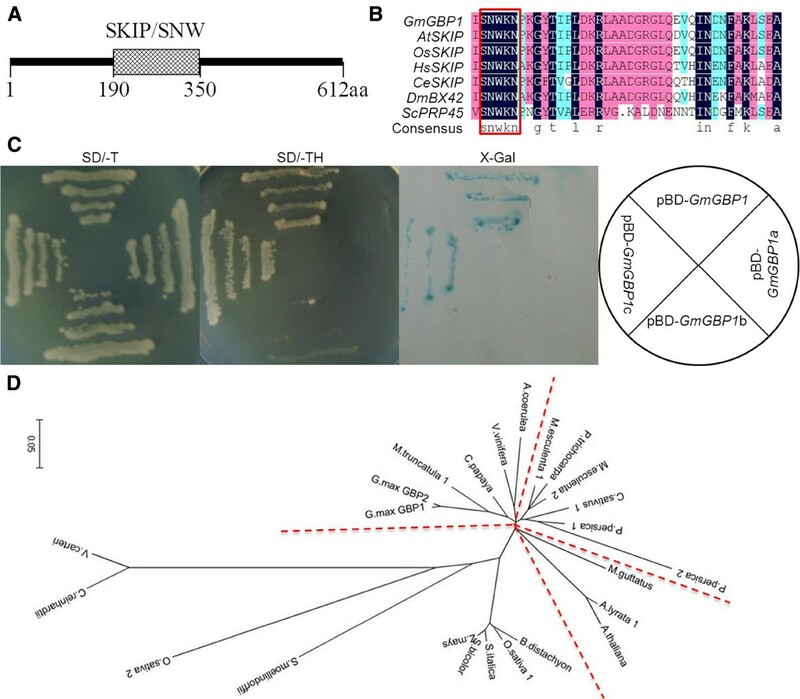 SKIP had a conserved SKIP domain with an S-N-W-K-N peptide signature, and was considered as a cofactor for transcription regulation in all eukaryotes so far. However, the derived or additional functions of the SKIP homologs varied among species. Transgenic rice that overexpressed OsSKIPa exhibited stress tolerances (abscisic acid, salt, mannitol) at both seedling and reproductive stages . 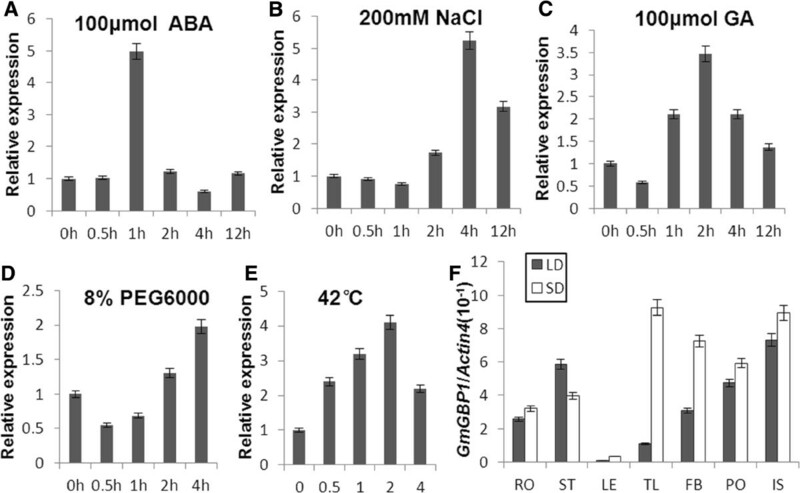 Overexpression of the AtSKIP gene in Arabidopsis modulated the induction of salt tolerance, dehydration resistance and insensitivity towards abscisic acid under stress conditions ; However, ectopic expression of GmGBP1 in Arabidopsis reduced tolerance to NaCl, but increased tolerance to drought and heat in this study. Suppression of OsSKIP resulted in growth arrest of rice due to the reduced cell viability in the active growth regions . 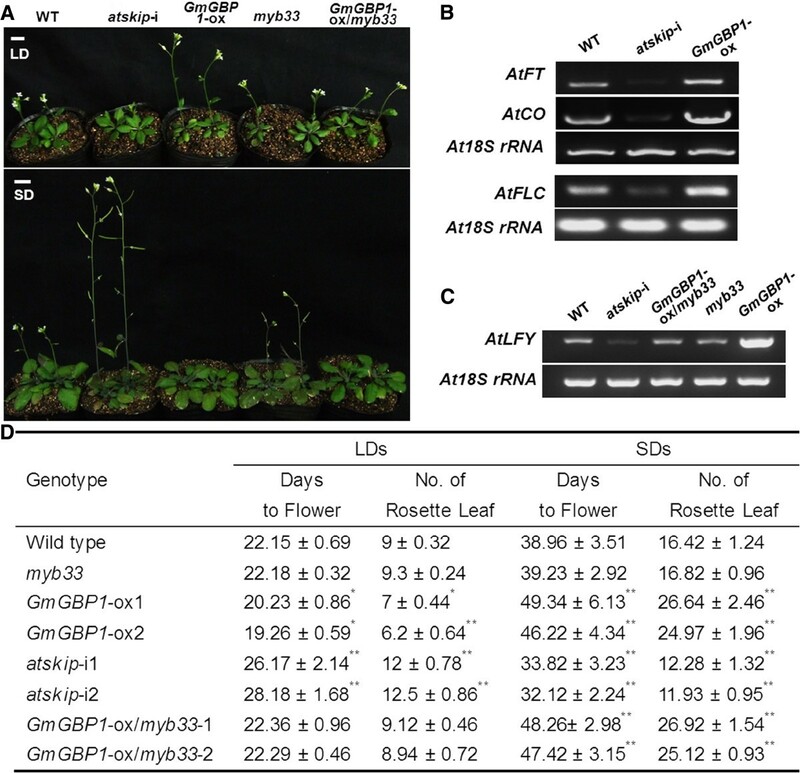 A decrease in AtSKIP expression led to altered plant development with the phenotype of reduced inflorescence stems and smaller rosette leaves . In this study, the homozygous atskip mutant was lethal to the growth, and the knockdown of AtSKIP showed late flowering and increased number of rosette leaves. The ectopic expression of GmGBP1 induced premature flowering of Arabidopsis in LDs. All the study on SKIP homologs in plant revealed that SKIPs might play a vital role in the growth and development of plant, but have different function on the stress tolerance and flowering in plant. Plant SKIPs were divided into four groups based on the SKIP sequences by phylogenetic tree (Figure 1D). The different groups among OsSKIP, AtSKIP and GmGBP1 indicated the diversity of their functions. SKIP could be induced by various abiotic stresses, phytohormones treatments and day-length, but the expression patterns of SKIP varied among rice, Arabidopsis and soybean [22, 23]. The transcriptional levels of OsSKIP, AtSKIP and GmGBP1 were all up-regulated by ABA, NaCl and drought (PEG6000 or mannitol), but had different scales. GmGBP1 could be induced by day-length and heat, but no related report for OsSKIP and AtSKIP in rice and Arabidopsis. The various functions of SKIP homologs might be also owing to the diversification of SKIP-interacting proteins SIPs. Previous studies showed that the SKIP homologs, PRP45 (yeast), BX42 (Drosophila), CeSKIP (C. elegans), HvSKIP (barely) and OsSKIP (rice) had 34, 13, 5, 1 and 35 interacted proteins, respectively [16, 20–22, 40, 41]. Nevertheless, few SIPs could match each other among species. For example, both HvSKIP and GmGBP1 interacted with GAMYB but OsGAMYB was not included in the 35 OsSIPs [21, 22]. All the data indicated that SKIP might participate in distinct functions through the interaction with diverse proteins. In this study, GmGBP1,as a homolog of SKIP in soybean, not only regulates plant flowering time but also alters plant resistance to abiotic stress in Arabidopsis. Such a flowering study about SKIP homolog in plant has no report so far. Although both OsSKIP and AtSKIP could improve plant tolerance to high salinity and drought [22, 23], GmGBP1 might improve plant tolerance to heat and drought, but reduce the resistance to high salinity. The flowering and stress related functions of GmGBP1 might be used to develop soybean cultivars with the adaptability to broad grow regions and environment. Pure seeds of soybean cultivar ‘DongNong 42’ (photoperiod-sensitive) were obtained from Soybean Research Institute of Northeast Agricultural University (Harbin, China). To analysis the tissue-specific expression of GmGBP1,the root, stem, leaf, trifoliate leaves, flower bud, pod and immature seed from soybean under both LDs and SDs were sampled. To analysis the expression of GmGBP1 under abiotic stress conditions, the soybean plants, with the first fully expanding trifoliate leaves, were transplanted into 1/4 Murashige and Skoog (MS)  liquid medium (no agar supplement) supplemented with 100 μmol gibberellin, 100 μmol ABA, 200 mM NaCl or 8% PEG6000. The plants that were transplanted into 1/4 MS liquid medium without the supplements of agar, gibberellin, ABA or NaCl were used as the control. The plants were sampled at 0, 0.5, 1, 2, 4 and 12 hours after transfer. Arabidopsis thaliana ecotype Columbia (Col-0) was used in this study. Seeds of atmyb33 T-DNA insertion line (Salk_058312) and atskip T-DNA insertion line (SAIL_681_H11) were obtained from The Arabidopsis Information Resource (TAIR). PCR with the gene-specific primer pair and T-DNA-specific primer were used for genotyping to identify homozygous T-DNA inserted plants. The left genomic primer (LP), right genomic primer (RP) and the left T-DNA border primer (LB) for atskip were as follows: LP: 5′ CAAGCACAAGAGAGTCCCAAG 3′ RP: 5′ CGCCACTTGCTCTCATAGTTC 3′ LB: 5′ GCCTTTTCAGAAATGGATAAATAGCCTTGCTTCC 3′. The LP, RP and LB primers for myb33 were as follows: LP: 5’ ATCCAGAACTGTCAGACGCTG 3′ RP: 5′ AATTGCGTATTTGGTTGGATG 3′ LB: 5′ ATTTTGCCGATTTCGGAAC 3′. After confirmation of homozygous T-DNA insertion, gene knock-out was confirmed by RT-PCR with gene-specific primer. Total RNA was isolated from soybean leaves using TRIzol reagent (Invitrogen, USA). Real-time quantitative RT-PCR was performed on a Chromo4 Real-Time PCR System (Bio-Rad, USA) using SYBR Green PCR Master Mix Reagent (Takara, Japan). The measured Ct values were converted to relative expression level using the ΔΔCt method. Soybean Actin4 gene was used as the endogenous control. Primers used were qGmGBP1-F and qGmGBP1-R; qGmACTIN4-F and qGmACTIN4-R (Table 1). Semi-quantitative RT-PCR was used to analyze the expression of flowering-related genes. Arabidopsis 18S rRNA gene was used as the endogenous control. The PCR products were analyzed through agarose gel electrophoresis and stained with ethidium bromide. All RT-PCR analyses were repeated three times, and one representative was shown. PCR-amplified cDNA fragments of GmGBP1, GmGBP1a (amino acids 1–189), GmGBP1b (amino acids 190–356) and GmGBP1c (amino acids 357–612) were cloned into EcoRI and PstI site of pBD-GAL4 as the bait constructs; PCR-amplified cDNA fragments of GmGAMYB1, GmGAMYB1a (amino acids 1–141) and GmGAMYB1b (amino acids 142–538) were cloned into BamHI and PstI site of pAD-GAL4 as the prey constructs. The primers used were: yGmGBP1-F and yGmGBP1-R; yGmGBP1a-F and yGmGBP1a-R; yGmGBP1b-F and yGmGBP1b-R; yGmGBP1c-F and yGmGBP1c-R; yGmGAMYB1-F and yGmGAMYB1-R; yGmGAMYB1a-F and yGmGAMYB1a-R; yGmGAMYB1b-F and yGmGAMYB1b-R (Table 1). All the bait constructs were transformed into the yeast strain YRG-2 respectively to detect the transcriptional activities. The yeast two-hybrid assay was performed using the GAL4 Two-Hybrid phagemid vector System (Stratagene, USA). The yeast strain YRG-2 was transformed with the bait plasmid, and the cells containing the bait constructs that have no self-activation activity were transformed with the prey plasmid according to the manufacturer’s instruction manual. The co-transformants were selected on synthetic complete selection medium lacking Leu, Trp and His. Large yeast clones appearing within 7 days were picked out to test the LacZ reporter gene. Positive clones were identified by the restriction digest analyses. The GmGBP1-overexpression construct was constructed by directionally inserting the full cDNA into the cloned vector pMD18T and then into the binary vector pCAMBIA3300. To make a dsRNAi construct of GmGBP1, a 505 bp fragment of GmGBP1, 73% of nucleotide homology to AtSKIP, was generated by PCR with primers GmGBP1-i-F and GmGBP1-i-R (Table 1) and cloned into pJawoh18 vector through attB × attP (BP) recombination cloning. The attB1 and attB2 were the two sequences for the BP recombination reaction (Invitrogen, USA). The constructs were transformed into the Agrobacterium tumefaciens strain LBA4404 and used to transform Arabidopsis ecotype Columbia using the floral dip method (Clough and Bent 1998). Seedlings were germinated on MS medium, and then transferred to 1:1 of vermiculite and turfy-soil and grown under LDs or SDs conditions. The flowering time of Arabidopsis was measured by scoring the number of rosette leaves at the flowering time and the number of days from germination to bolting . At least 20 plants were analyzed each time, and the experiments were repeated for three times. This work was supported by National Core Soybean Genetic Engineering Project (Contract No. 2011ZX08004-005), Chinese National Natural Science Foundation (31101169, 31271748), Soybean Research & Development Center, CARS and National education Ministry for the teams of soybean molecular design. YZ, LZ and WL designed the study. YZ and YG performed the experiments. HL, YL, XW, WT, YH and XZ contributed reagents/materials/analysis tools. YZ, LZ and WL analyzed the data. YZ wrote the manuscript, which was further edited by LZ and WL. All authors read and approved the final manuscript.